The Mid-coast Trolley Project continues in University City. Recently, SANDAG crews set 60-foot-long concrete girders, or beams, to construct the elevated guideway for the future Mid-Coast Trolley. 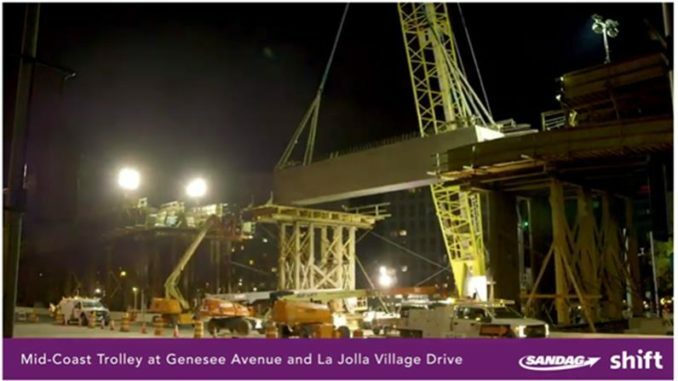 As shown in this time lapse video, crews hoisted the 95-ton precast girders using a crane and set the girders on the columns that were built at the intersection. The Mid-Coast Trolley Project will extend Blue Line Trolley service from Old Town north to the University City community, serving major activity centers such as Mission Bay Park, the VA Medical Center, UC San Diego, and Westfield UTC. Major construction work began in 2016, with service anticipated to begin in 2021.